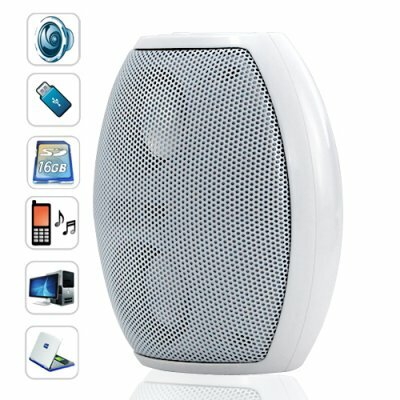 Successfully Added Audioblaster - Mini Speaker with MP3 Player Function (USB, SD) to your Shopping Cart. Small speaker. BIG SOUND! That's exactly what you get with The Audioblaster mini speaker that plays mp3 files! So it's a speaker? YES. And it plays MP3 files? YES. So it's an MP3 player with built-in speakers. NO! It's a speaker that plays MP3 files!! You're going to love The Audioblaster whether you're buying it for yourself or your online customers. Basically it's a mini speaker with slots at the back for an SD card or a USB flash drive. Plug in your flash memory and The Audioblaster automatically plays whatever MP3 files it finds! Best of all is the sound output from these mini-speakers! Surprisingly powerful and stunningly clear, The Audioblaster handles deep bass and sharp tones like a pro for a brilliant stereo performance of the highest highs and the lowest lows everytime! Hear them for yourself and you'll agree that this baby sounds better than speakers double or triple its price. This makes a wonderful iPod speaker! Want to know more about the latest in personal electronics and digital media products? Do you want to read stories regarding new products before anyone else? Then read our blog at blog.chinavasion.com or subscribe to our RSS newsfeed to keep up with what is happening in the world of China Wholesale Electronics.